Background: Lipids are a class of molecules that play an important role in cellular structure and metabolism in all cell types. In the last few decades, it has been reported that long-chain fatty acids (FAs) are involved in several biological functions from transcriptional regulation to physiological processes. Several fatty acids have been both positively and negatively implicated in different biological processes in skeletal muscle and other tissues. To gain insight into biological processes associated with fatty acid content in skeletal muscle, the aim of the present study was to identify differentially expressed genes (DEGs) and functional pathways related to gene expression regulation associated with FA content in cattle. Results: Skeletal muscle transcriptome analysis of 164 Nellore steers revealed no differentially expressed genes (DEGs, FDR 10%) for samples with extreme values for linoleic acid (LA) or stearic acid (SA), and only a few DEGs for eicosapentaenoic acid (EPA, 5 DEGs), docosahexaenoic acid (DHA, 4 DEGs) and palmitic acid (PA, 123 DEGs), while large numbers of DEGs were associated with oleic acid (OA, 1134 DEGs) and conjugated linoleic acid cis9 trans11 (CLA-c9t11, 872 DEGs). Functional annotation and functional enrichment from OA DEGs identified important genes, canonical pathways and upstream regulators such as SCD, PLIN5, UCP3, CPT1, CPT1B, oxidative phosphorylation mitochondrial dysfunction, PPARGC1A, and FOXO1. Two important genes associated with lipid metabolism, gene expression and cancer were identified as DEGs between animals with high and low CLA-c9t11, specifically, epidermal growth factor receptor (EGFR) and RNPS. Conclusion: Only two out of seven classes of molecules of FA studied were associated with large changes in the expression profile of skeletal muscle. OA and CLA-c9t11 content had significant effects on the expression level of genes related to important biological processes associated with oxidative phosphorylation, and cell growth, survival, and migration. These results contribute to our understanding of how some FAs modulate metabolism and may have protective health function. This article is published as Cesar, Aline SM, Luciana CA Regitano, Mirele D. Poleti, Sónia CS Andrade, Polyana C. Tizioto, Priscila SN Oliveira, Andrezza M. Felício et al. 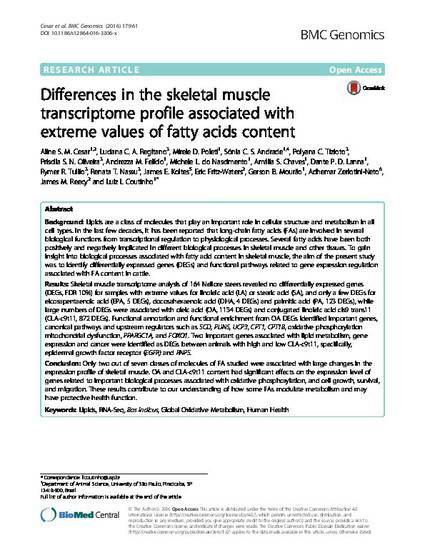 "Differences in the skeletal muscle transcriptome profile associated with extreme values of fatty acids content." BMC genomics 17 (2016): 961. doi: 10.1186/s12864-016-3306-x.